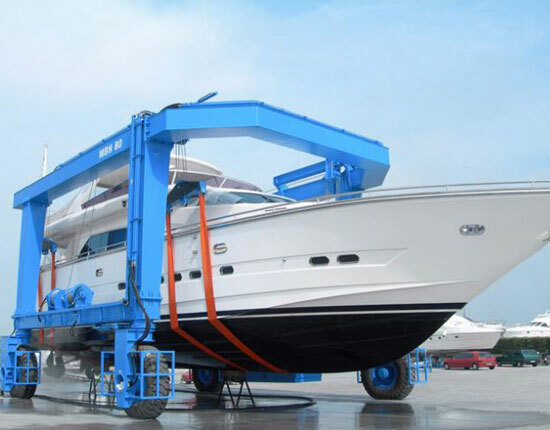 Boat Gantry Crane - Boat Hoist - Travel Lift for Sale From Ellsen Inc.
Boat gantry crane, as known as boat hoist, boat lift or travel lift, is a sort of non-standard gantry lifting equipment specifically designed to handle vessels of different shapes and sizes. It is mounted on rubber tires to achieve great mobility. The mobile boat crane is also equipped with independent steering system to ensure high maneuverability. Our boat gantry cranes can be fully functional under any condition, and we can ensure maximum efficiency, reliability and security for the boat handling process. Specialized in lifting equipment for over 10 years, we always provide the most reliable and durable products for our clients that are aimed for decades of trouble-free service. 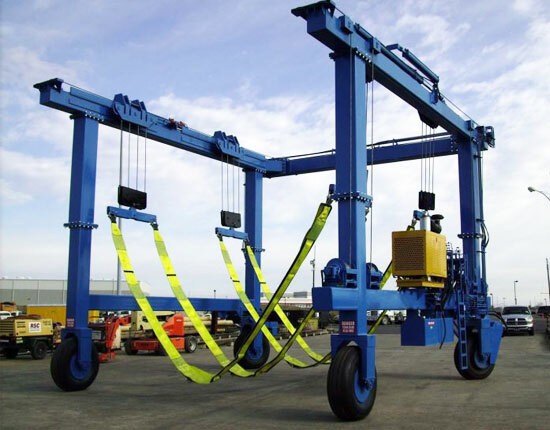 Our boat cranes comes in a variety of options for your wide applications. They can be classified into small boat lift, medium boat travel lift and large boat hoist according to the size of the vessel, hydraulic boat lift and electric boat hoist according to the power source, 50 ton travel lift, 100 ton travel lift, 200 ton boat hoist, 500 ton boat crane and 1000 ton marina travel lift according to the lifting capacity. Would you like to know which type of gantry crane is right for your operations? Specify your lifting requirements such as rated lifting capacity, span, overall width and height and lifting speed. With our excellent technical team, we are capable of designing the perfect solution for your needs! Boat gantry crane is mainly used to handle various ships in marinas, shipyards and commercial yards. It performs several functions for your operations, including lift-in, lift-out and transportation work. To be specific, it can lift small to large boats out of the water for repairing or maintenance in the yard. It is also ideal for launching a newly built ship into water. Besides, the boat lift crane is able to transport vessels from one location to another and arrange them in a row so as to increase the utilization of limited yard space. Boat gantry crane is an important tool for vessel handling with excellent reliability and safety. It is built with a range of capacity, usually going up to 1200 tons. Our boat cranes can be designed and built according to the different requirements of customers so as to fit different vessel configurations. For further information, contact us online! Our boat gantry crane features simple and sturdy structure, mainly composed of the gantry framework, hoisting mechanism, steering system, wheel set, hydraulic transmission system and electrical control system. The main metal structure is a U-shaped gantry frame which is easy to carry vessels of different shapes and tonnages. It is able to handle ships of which the height exceeds the crane itself. The main and end beams are articulated to eliminate structural stress that is caused when travelling on uneven ground surface. Both hoisting and travelling mechanisms adopt hydraulic transmission system which delivers smooth movement, fast response, low inertia and easy operation. 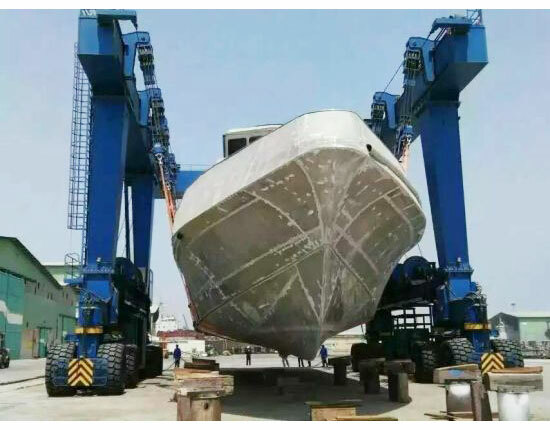 The hoisting mechanism allows for adjustment of multiple lifting points to meet different hull configurations and ensure a synchronous lifting. It can also effectively disperse the force acting on the hull. We also utilize soft and strong slings to evenly haul a boat without any damage to its surface. The steering system comes in a number of options, such as fixing axle steering, 90 degree steering and Ackermann steering to meet different working conditions. With flexible steering system, our boat travel lift can function even in a very confined space. The operation mode comes in two options, including remote control and cabin. Remote control is a cost-effective solution found in the most of boat gantry cranes, whereas the cabin control is more often applied in large tonnage boat cranes such as 200 ton, 300 ton, 500 ton and beyond. Why Buy A Boat Travel Lift Crane From Ellsen? Our boat travel lifts provide high level of reliability in terms of productivity, strength and safety. Whatever your applications, you can find the most suitable and affordable solutions at Ellsen factory. Design – we can design every aspect of your crane from capacity, span to the paint color as required. We also offer custom design to meet special requirements of customers. Fabrication – we utilize the state of art processing facilities to make sure each product is with high quality. Price – each of our travel lift for sale is with factory price. Service – we provide gantry crane delivery, installation, testing and maintenance for our customers and are dedicated to solving any problem they have. We strive to be your dependable supplier. 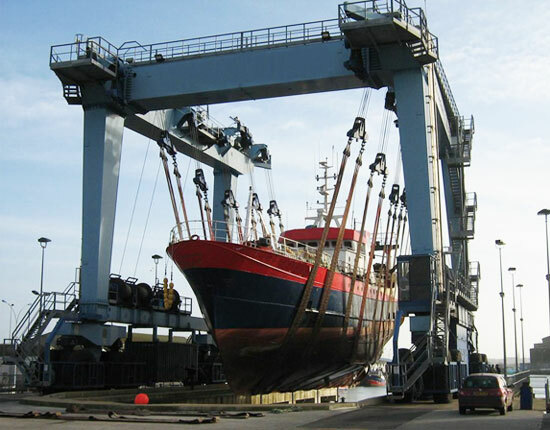 To receive a free boat gantry crane quotation, call us now or send email to us.